When I newly started with make-up a couple of years back, I used to mix my foundation in my moisturizer and apply it just like one applies moisturizer rubbing all over the face! Then over the years, I saw a lot of YT videos to learn the foundation application technique and saw a lot of them using the duo fiber stippling brush for that flawless foundation application. So, I started using a duo fiber stippling brush (Vega's duo fiber brush). It did the job pretty well, but, absorbed a lot of foundation. Probably that was a con of using a cheap brush for foundation application. 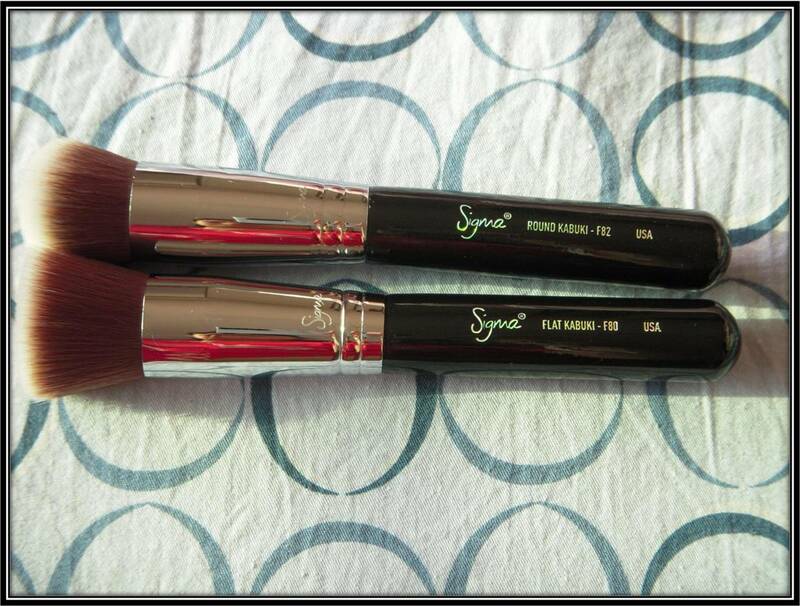 Then happened a miracle at Sigma and they launched their famous set of Brushes - Sigma F80, F82, F84 and F8, F80 and F82 being most raved about brushes for foundation application. I wanted F80 & F82 ever since they were launched but the shipping cost always stopped me from buying, but, last month I bought them without thinking much about the shipping cost. Yep, I bought both the brushes, F80 and F82, and I am not at all regretful about the impulsive purchase. They are awesome in all senses. This one is a flat top synthetic kabuki brush, which can be used as a buffer brush to blend powder or liquid foundation. This one is a round top synthetic kabuki brush, perfect for precise application under the eyes or around the nose and for a flawless coverage of liquid or powder foundation. I can't believe how soft these brushes are, just like dream give such ice feeling of luxury while using. I use these brushes alternately to apply my liquid foundation and they both does an excellent job. My foundation was never so flawless. It's much more dense than any duo fiber brush. 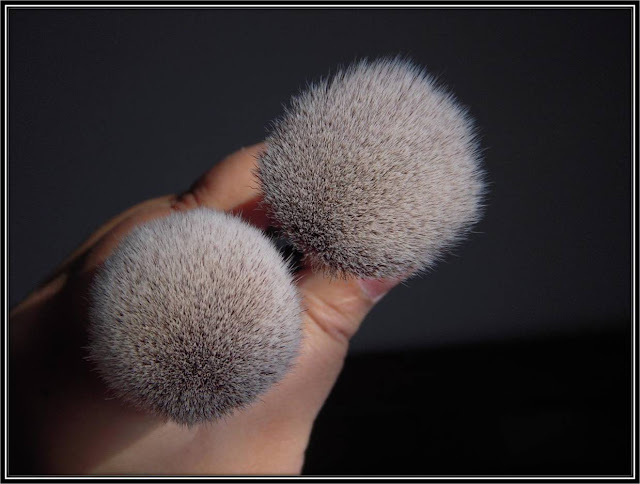 F82 brush's hair are more densely packed and are curved on top unlike F80, as you can see the pictures below. With F82 application around nose and under the eyes is slightly easier, because of it's round shape and I feel that F82 gives more coverage because of it's densely packed hair. Except for this they are very similar in nature and give exactly the same results. Overall, I would say that they are awesome brushes as far as their job is concerned. 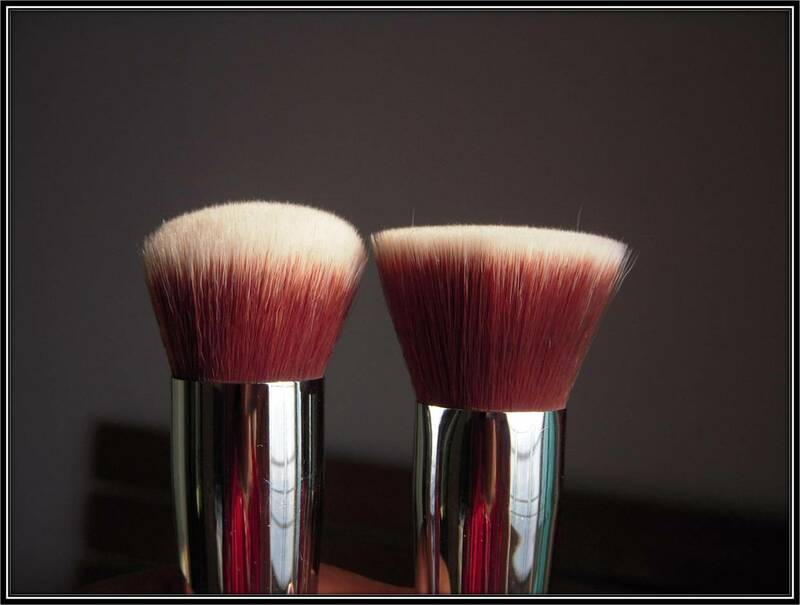 I am loving them and I feel that my foundation application has become much easier and flawless with these brushes. For recommending, I think, we all are wise enough to decide what is good/ bad for us. So, I leave it to you to decide for yourselves whether you want these brushes or not, but in my opinion they are fabulous and a must have brushes for foundation application. I hope that they review was useful to some of you. I want Sigmaaa!!!!! this luk so fab Eesh..
Oh my. I love these brushes to bits. but the shipping ia s b@#*h. But I want to buy them anyway.......Eesha, can we have a photo tut of the foundation with these two brushes. 'Deliciously Forbidden' - Make-up Look! Spring Make-up - Purple & Bronze make-up look! Spring Make-up - Pink & Bronze make-up look!